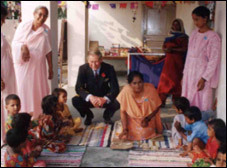 He commented: "Arpana's humanitarian work is, I think, a model of its kind, which can be used and adapted throughout the developing world. It combines total professionalism and quality with the utmost dedication and love." 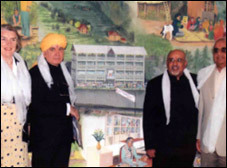 He saw the Arpana Hospital and health/development work in a nearby village, and met Param Pujya Ma and members of Arpana. 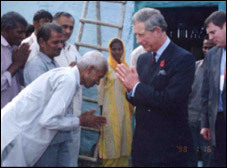 Through the efforts of Dr Raghu Gaind, Chairman of Arpana Charitable Trust U.K., Prince Charles interceded with Prince Al Walid of Saudi Arabia, who made a generous donation of $1 million for Arpana's medical and development services at the Molar Bund slum in Delhi, in 2002. 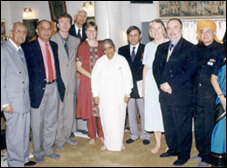 A Dinner was held at Clarence House, which helped to support our services in Haryana & Himachal Pradesh in 2005-2006. "There are so many people all over the world who suffer desperately from poverty, lack of education and general lack of opportunities. The Indian villages which Arpana serves are disadvantaged in all these ways. They are in enormous need of a helping hand to put them on their feet, and with Arpana's assistance, we are trying to ensure that they are given the chance to live with dignity, and that their children look forward to a better future." 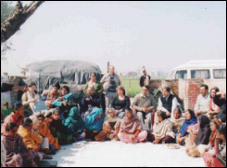 "Arpana reached out to Britain to seek friends and committed support from the Indo- British community, and I'm delighted to say that Indians from all over the world have come together to offer a truly multicultural dimension to overseas aid." "I do wish Arpana every possible success over the years to come in its most important work." 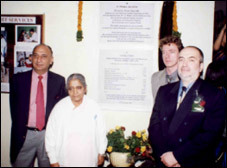 Mr Jagjit Singh, Aid for Indian Development, USA, has been making contributions to Arpana's services, and forwarding donations from all over the USA, without any charge, for the past many years. He is a most valuable friend and adviser.
" 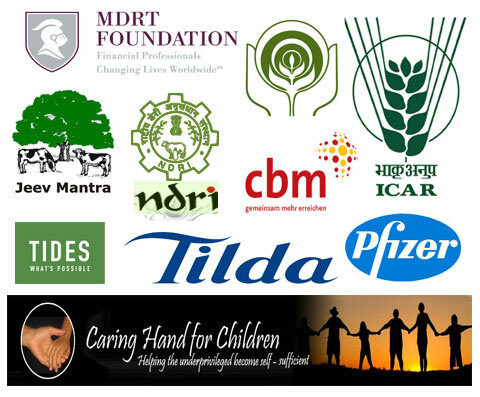 Madhuban is a symbol of spiritual striving and humanitarian endeavour. 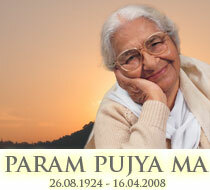 It represents the purity and clarity of the thought underlying ARPANA. It reflects the sublime quality of consecrated action in ARPANA." " This exposure was a wonderful experience to see Spirituality and the true spirit of volunteerism in action. Truly inspiring!" 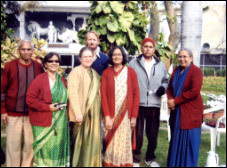 " The place is vibrant with wonderful Sewa ( selfless service) and Vedantic thoughts and has a very sublime and wonderful effect upon even the chance visitors." 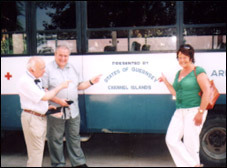 "The visit was a rewarding and uplifting experience giving peace and harmony of mind. An unforgettable event." "The approach to the Rural Health Services is working towards a developmental and sustainable model. The Hospital strives for excellence in a rural setup, and the ambiance of peace, dedication, and commitment is exemplary." "A truly inspiring experience. I hope similar endeavors are initiated in all other parts of the country and the world." "A work of great commitment, compassion and strength - motivating for all." "The magnificent work here makes everyone to become a follower - to give more." "Thank you for such a heartwarming visit. I am so overwhelmed in the way you have touched and will continue to touch so many people's hearts." "It has been an educational and a humbling experience to see such love in action." 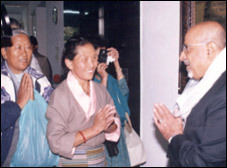 "I have immense admiration for the wonderful work done by Arpana - both here and at Dalhousie/Chamba. A most impressive visit." "This was a spiritual experience of its own kind. I have seen love in action, and divinity in reality." "Great joy from serving and sharing! This is what we believe and practice in Canada as well. We welcome immigrants from all over the world, invite them to share our resources, and be a member of the greater Canadian family." G.K. Noon, M.B.E, Noon Products, U.K.
"Arpana - seeing is believing, a most wonderful experience. One can find lots of peace here." "Our time here was much too short but most rewarding. May you continue your community and service."